Consumer demand for quality digital video content continues to increase. According to recently released statistics, 43% of respondents said they’d like to see more video content in their social media feeds. But before you start uploading a glut of homemade iPhone video, remember: the quality of your creative reflects the quality of your brand. Content for content’s sake isn’t a good look. So, sure, you could trust your brand’s image to your cousin in film school and his iPhone. But, while phone camera technology has come a long way, it’s not always the best option when your brand is hanging in the balance. There’s a lot a professional video shoot can bring to your brand’s story that an iPhone just can’t. And there’s really no reason to opt for an iPhone video over a professional shoot. For starters, professional video camera equipment is getting more affordable as technology continues to advance. 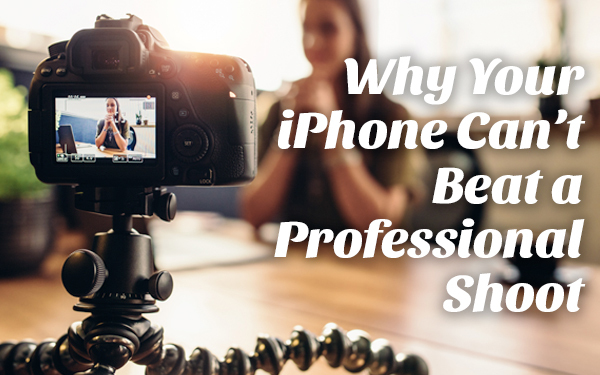 So, using an iPhone instead of a professional crew really won’t save you anything — especially when you consider all the extra add-ons you’ll need to purchase in order to shoot iPhone video: memory cards, lenses, stabilizers, external microphones, software and more. Yes, an iPhone is a great tool for filming in tight spaces where it’s more difficult to use professional equipment. And an iPhone is a great tool for Facebook Live streaming, Periscope and the like. But a tool is just a tool; it’s only as good as the person who wields it. The greatest benefit of a professional shoot is the professional that comes with it. Because it doesn’t matter how good an idea is unless it’s well executed. When it really comes down to it, shooting commercially on an iPhone is mostly done for novelty and gimmick. Ready to upgrade your brand from home movies to the Hollywood treatment? Get in touch.